When it comes to Radiant Heated Driveway Systems, you may have more Options than you Realize. So you’ve decided that a radiant heated driveway is in your future, and may be asking, now what? If you’re looking for high-quality, reliable radiant heat solutions, look no further than Warmzone. As a trusted provider of quality radiant heat solutions, Warmzone has made a name for itself by offering the best selection and prices available on radiant snow melting systems and heated floors, and for providing a creative approach to finding solutions to meet the needs of its customers. Warmzone takes three general approaches to heated driveway installation. To keep paved areas completely clear and free of snow and ice, radiant heating cable can be installed underneath entire driveway and/or walkway surfaces. Other snow melting options include installing either an 8-10 foot wide strip of heating cable, or two 24-inch wide tracks of radiant heat cable up the middle or main traffic area of your driveway. Warmzone has built a reputation not only on their approach to a variety of radiant heat systems, but on their state-of-the-art products. ClearZone cable is durable resistance heat cable used to melt snow and ice in harsh weather conditions. It is built specifically for heated driveways, sidewalks and other common areas that require snow removal in the worst conditions. Easy to install and easily customizable, ClearZone heat cable provides an effective, energy efficient and environmentally friendly snow removal solution that is virtually maintenance free. ClearZone electric radiant snow melting cable is available in pre-configured sections, or mats, for easy installation. 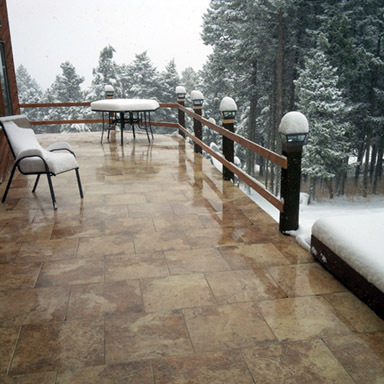 These snow melting mats are built specifically for electric heated driveway systems, sidewalks and other common areas. 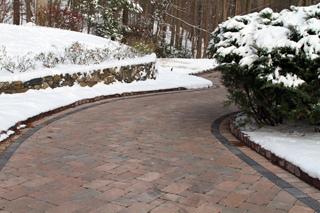 They’re designed for ease of installation and proper cable spacing for optimum snow melting efficiency, whether you choose to heat an entire driveway, or target high-traffic areas. They can be rolled out for safe installation in new concrete pours, under pavers and even in high-temperature new asphalt projects. Of course, you may not be ready to pour a new driveway right now. Perhaps the thought of rolling out ClearZone snow melting cables or mats over your existing pavement does not appeal to your aesthetic sensibilities. But don’t rule out a heated driveway in your future just yet. ClearZone radiant heat cable is easily retrofitted into existing surfaces. Using concrete saw-cut technology, grooves can be cut into existing concrete or asphalt. The ClearZone radiant heat cable is then laid into the grooves and sealed with a special epoxy topcoat for efficient, effective snow removal. Choose Warmzone, and you not only benefit from cutting-edge radiant heat technologies, but a team of radiant heat specialists with the experience and the expertise to design a snowmelt system to satisfy your objectives and budget. From start to finish, our professional designers can evaluate your radiant heating system requirements, and based on this information, create a detailed CAD schematic of your heated driveway system layout. You’ll know the electrical requirements, technical specifications and system performance expectations before heat cable is installed with no costly installation surprises later on. For more information on radiant heated driveways, radiant floor heating, or roof deicing and gutter trace systems, browse our web site or call 888.488.9276 today.